If you’re in the market for a highly versatile and rather affordable hunting knife, this Gerber unit is definitely worthy of your consideration. It’s also made in Portland, Oregon, so it speaks to the requirements of those hunters that are in search of a knife made from quality materials and crafted in the United States. It’s a rather sensible option for hunters who are on a budget, especially those that are at the beginning of their learning curve. The Coyote Brown color it comes in even looks good, so you’ll find it a pleasure to use it even visually. The Strongarm comes with a 420 HC ceramic-coated steel blade that measures 4.8 inches in length. The whole knife measures 9.8 inches, so it’s reasonably sized and fit to handle a lot of applications. It weighs in at 7.2 ounces on its own and about 11 ounces complete with the MOLLE strap and the sheath. The full tang construction boasted by this alternative is an advantage in itself, and the best thing about it is its versatility since it can cut anything from wood and paper to rope and even thin metal (like soda cans, for example). Needless to say, you can also utilize it for meat removal and skinning purposes and it cuts through these just like through butter. One aspect that needs to be considered is the fact that this product boasts a steel blade. What that means for you is that you’ll get both an advantage and a disadvantage. On the one hand, steel is extremely reliable and it makes this knife capable of standing the test of time, allowing you to use it for as many hunting seasons without worrying about it leaving you down when you need its services the most. Another advantage is that it doesn’t require as much effort in the way of maintenance as some other materials. It does have to be sharpened from time to time. Finally, we’d like to note that carbon steel is better when it comes to retaining sharpness and keen, so there’s that as a downside that you have to mull over to decide whether this tool suits you or not. Based on the owner feedback, the blade can dull rather quickly, which means that you will have to sharpen it regularly to ensure that its edge is kept. 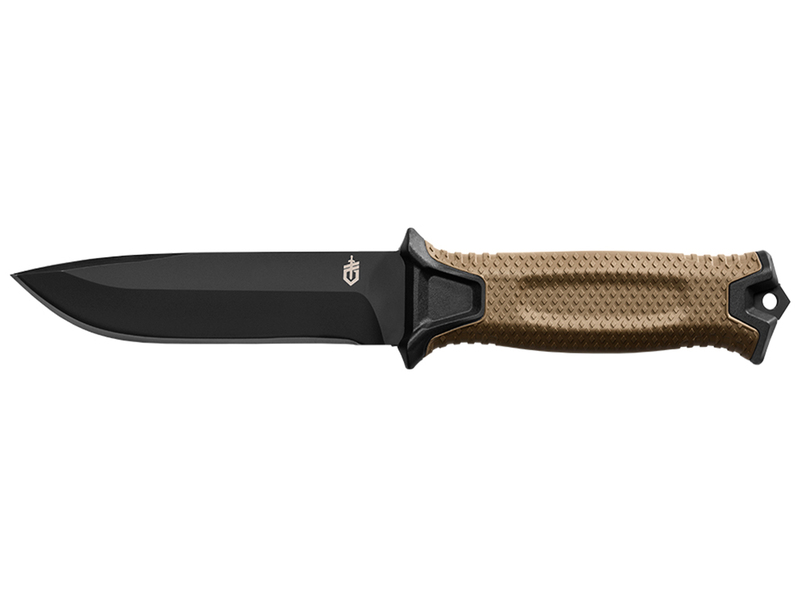 The handle of the Gerber Strongarm Coyote Brown is also something to write home about. It boasts a rubberized diamond texture grip and adds a lanyard hole at the base and a striking pommel. The rubberized texture is an advantage in itself, especially if you do not want to cut yourself while skinning your prey. What that means for you is that you will be able to maneuver this cutting tool even when the weather isn’t on your side and in wet conditions, especially those involving blood. The small hole to place the lanyard is a great feature, and the proportions between the handle and the blade make it comfortable to hold and highly ergonomic. Due to its design, it can be conveniently used by people with small and large hands alike. The point is that this handle is just as good as the blade considering that you can even use it to break glass in case there’s an emergency you need to manage. Note that the handle can seem a bit thin if you’re used to thicker ones. What about the sheath? Needless to say, this is an important aspect to take into account when you’re comparing knife models. This one has one of the most versatile sheaths in this category since it can be carried either vertically or horizontally, in your backpack or on yourself. Thanks to the holes boasted by the sheath, you will be able to mount it on any belt, body armor, or pack so carrying it will definitely not be a nuisance. There have been some issues reported with regard to this accessory, however, and they typically revolve around the belt loop attachment, which could use some improvements in relation to its design. As we have noted before, this is a budget-friendly option, but none of the features it comes with make it cheap in any way. It’s dependable, well-balanced, and can be used for multiple purposes, and it’s also rather easy on the eyes. It’s designed for outdoor adventurers of any kind, be they fishermen and women, hunters, or hikers.